Every year around this time, I usually have a long list of holiday cookies written out that I wish to bake. Most years, I’d get to bake my entire list, or close to it, leaving us with a decent amount of cookies to snack on after Christmas has passed. This year, I find I’m not left with a lot of time for holiday baking. December has been one of my busiest and most overwhelming months this year. So with some disappointment, I’ve scrapped my holiday cookie list this Christmas. If I get to try out some of my new cookie cutters and make sugar cookies, I’ll be a happy girl. If not, I figure there’s always 2016! This week, I ended up with a major craving for cupcakes and therefore got myself into the mood to do a little baking. So I bought a box of vanilla cake mix and a container of frosting during a grocery run. 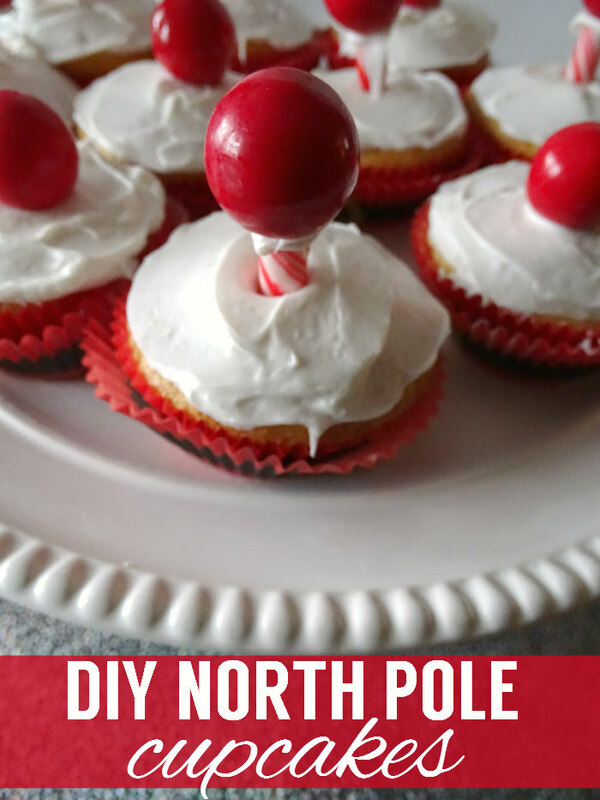 Instead of just whipping up a batch of cupcakes and quickly slathering them with frosting, I decided to get into the holiday spirit and create adorable North Pole inspired cupcakes. They turned out exactly as I hoped they would – cute and delicious! These cupcakes are so easy to make (Hello! Boxed cake mix, for the win! ), but look so adorable that your holiday party guests will be super impressed with your baking skills – even if you lack them! Prepare cake mix according to package and pour batter into Santa suit baking cups. Double up on the baking cups so the design really pops. Allow cupcakes to cool completely, then pipe or spread icing over cupcakes. 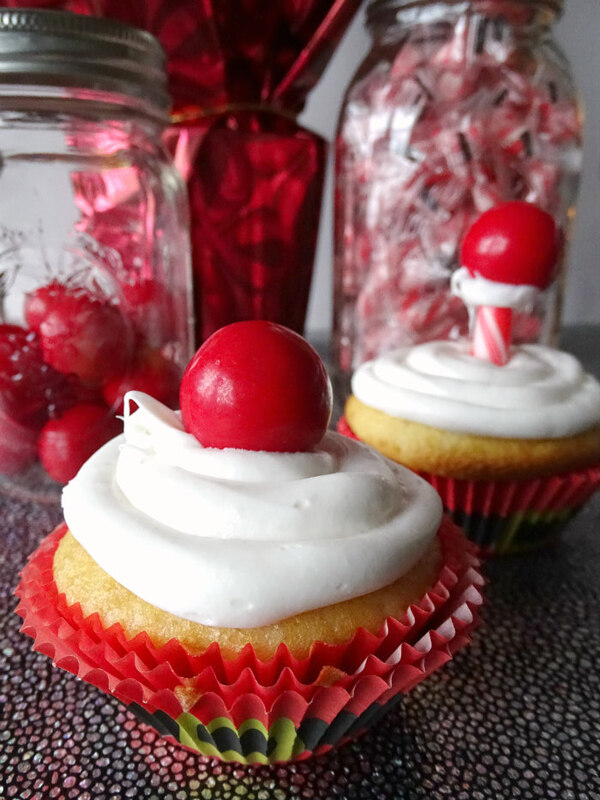 Stick a red mini candy stick in each cupcake. 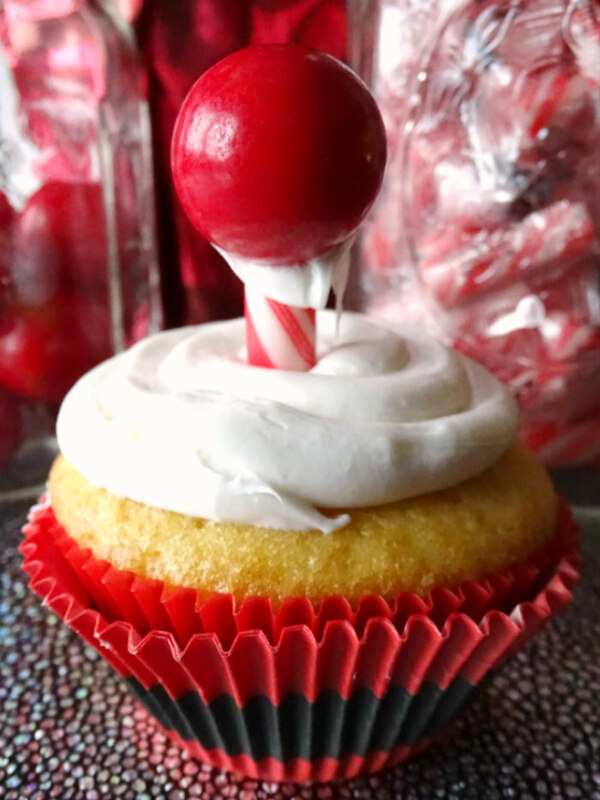 Dip a red gumball in icing, then carefully stick on top of red mini candy stick. The icing will act like a glue and allow the gumballs to sticks on top of the candy sticks. Serve cupcakes on a holiday plate and enjoy! If you aren’t a lean, mean piping bag machine (don’t worry, I’m not either and stopped piping out frosting after only two cupcakes), frost your cupcakes as you normally would. They’ll still look just as adorable and taste just as good! You can get a fabulous price right now on some of the supplies you need to make these cupcakes through Oriental Trading. Happy baking! Are you planning on doing holiday baking this year?